ICND has been working with Monica Davis Real Estate for many years. Earlier this year she came to us interested in new responsive MLS website with a modern design, and user friendly searching features. 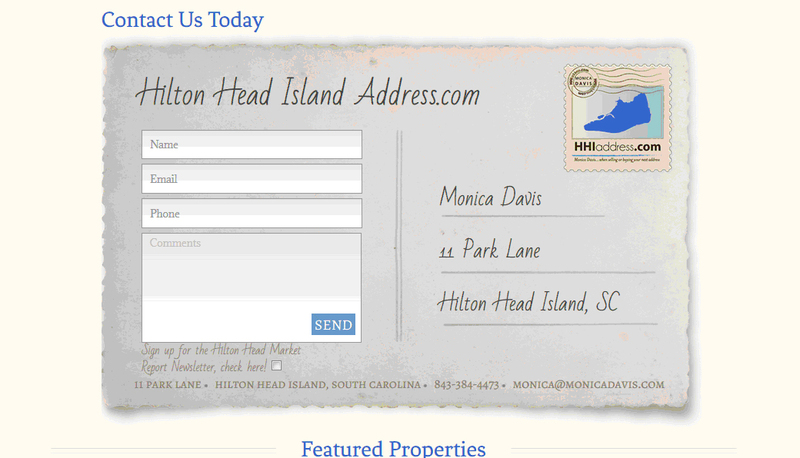 We worked with Monica and her team and have launched the new and improve HHI Address website. The new website is integrated with the Hilton Head MLS and has all of the features of ICND’s user friendly MLS 3D. Features include the ability to create an account, save properties, send them to a friend, sign up for listing alerts and more! Monica Davis Real estate decided to rebrand themselves earlier this year under the name HHI Address. The new logo has the look of a stamp, and we matched the creative direction of the website to the stamp look. One of our favorite pages on the website is their contact us page, built to look like an envelope with an address and stamp! Our creative team has worked with the team at HHI Address to develop a website that is not only user friendly, but also stands out from the crowd. HHI Address is also participating in a PPC campaign with ICND to start directing traffic to their new website. This team of Hilton Head Real Estate experts now have the online tools in their hands to really show how they shine!